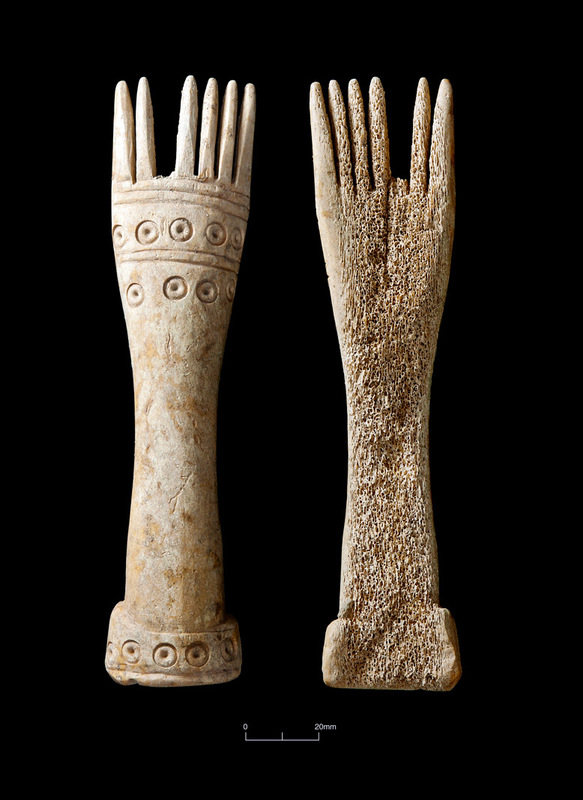 These worked bone objects came to light during Cotswold Archaeology’s large-scale excavations close to the town ahead of the construction of a new Sainsburys supermarket. 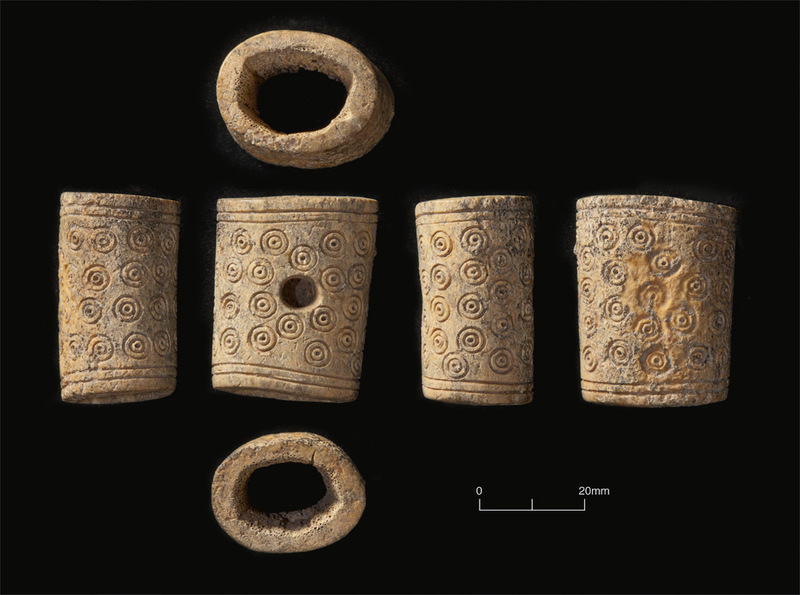 The 2009 excavations revealed a very complex pattern of occupation at the site beginning in the Late Bronze Age (c. 1000 BC) and continuing into the Iron Age, Roman, Anglo-Saxon and medieval periods. The most spectacular archaeological features were a series of Iron Age defensive ditches, some of which were 5 metres deep. Most of the Iron Age finds were recovered from the many deep pits which had been dug into the chalk geology. Similar pits are common from Iron Age sites and it is thought they were used for the storage of grain. After use pits of this type were back-filled and often contain a range of artefacts. Some archaeologists believe objects such as those shown deliberately placed in pits as part of a religious ritual. Objects 1 and 2 date to the Middle Iron Age, probably to the 3rd-1st centuries BC. They can tell us a lot about the activities which took place at the site in this period. The large fork-like bone object (no. 1) is a weaving comb used with a vertical warp-weighted loom, probably to push down the woollen yarn or weft. It has been carefully carved from a horse longbone and is decorated with rows of punched or drilled rings. Object no. 2 is a ‘toggle’ fastener and is richly decorated with ring and dot motifs. Toggles were widely used in the Iron Age in place of buttons or buckles. Object no. 3 is a hair comb which dates to the later Anglo-Saxon period (10th or 11th centuries AD). 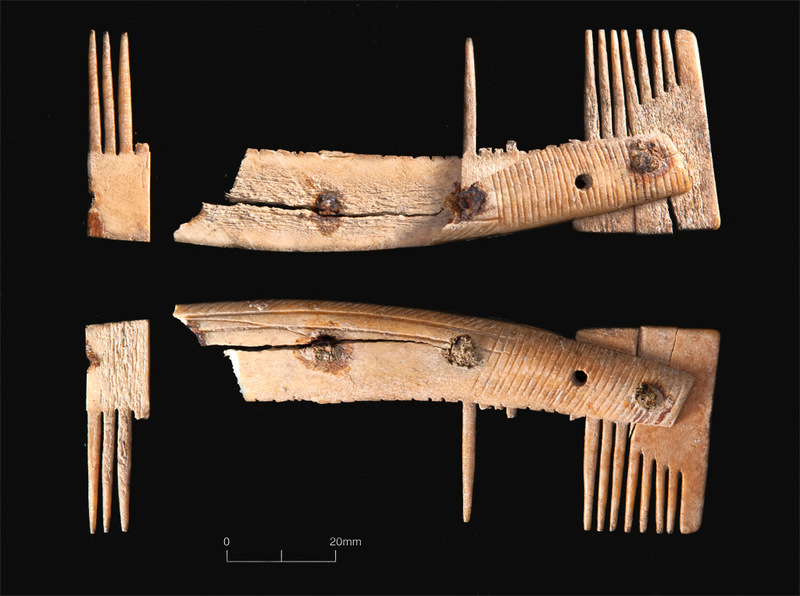 Combs were essential for the removal of lice and other parasites. 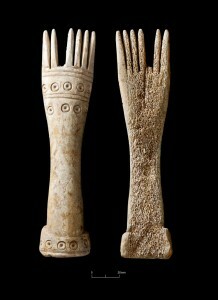 This example has been made from three pieces of bone which are held together with iron rivets.